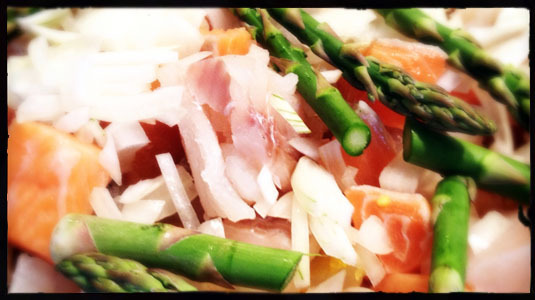 This is a really simple and delicious recipe for a fish pie. It doesn’t require you to be poaching fish, or making a roux. Just get all the ingredients together and slam in the oven. Put your potatoes on to boil, and cook until tender. While your spuds are cooking. Spread all the prawns, squid and mussels in the bottom of a large casserole dish. Chop all the fish into small chunks and throw these on top. Pour the lemon juice over the fish mixture and add the parsley. Add the asparagus and spinach over the top then drizzle some olive oil over the whole dish. Grate over some parmesan then season with salt, pepper and celery salt. When your potatoes are cooked, mash with cream, olive oil and season to taste. Spoon the mash over the fish mixture. Grate some cheddar and parmesan over the top and grind a little pepper too. Put the pie into the oven for 40 mins at 200 degrees C. It should come out a little crispy, but watch out will be very hot, so let it cool for a few minutes before serving with samphire or sea kale.